Gentleman’s Horse Farm! Country escape less than 15 minutes from the convenience of Midlothian. 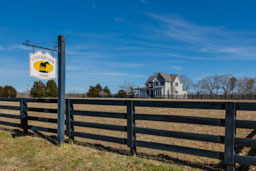 Bring the horses and all of your furry friends to enjoy this gorgeous country estate. Farmhouse traditionally styled with all the modern amenities. First floor features 10 foot ceilings, gourmet eat-in kitchen with tons of storage, open floor plan to dining room and living room with gas fireplace, office, half bath and large mud room a plus. First floor master suite with dual walk in closets, standing shower, and soaking tub. Upstairs find 2 over sized bedrooms and 1 over sized bath with 9 foot ceilings. Whole house filtration & tankless water heater! Outdoor living spaces galore include screened side porch leading to yard safely fenced for dogs of all sizes. Four stall breezeway barn includes a large tack room outfitted with blanket racks, saddle racks, and bridle brackets. 12x12 stalls are rubber-matted and feature exterior dutch doors. Enjoy expansive pasture space, a 60ft round pen, and professional trails cut into the shade of the woods in the back of property. 6 acres with house & barn, option to purchase adjacent 10 acre plot for more pasture & woods property. Directions: Rt 60 West, Left On Rt 13 Just Past Academy Rd. Left On Rocky Ford Rd. House Is Less Than 1/2 Mile On The Left.